It was 1969 and my time at the local community college hadn’t worked out as planned. The options were to either enlist or to wait and see how lucky I would be in the draft. I decided to enlist. One of my father’s friends had been in the Coast Guard during World War II and he spent his entire tour of duty in Evanston, Illinois. Since I lived my entire life in the Chicago area, Evanston didn’t sound all that bad to me. Little did I know a local assignment wasn’t for me. My dad’s friend also said I’d be a name rather then a number because the Coast Guard was small by comparison to the other branches of the military. After hearing from my dad’s friend I went to see the Coast Guard recruiter about enlisting in the CG and did just that. we joined up with about 10 others heading to Cape May for boot camp. The bus ride was fun. We arrived in Cape May about midnight and things changed quickly. The bus ride to the base was nowhere near the fun the ride from Philly had been. We were informed we would not be sworn at and we were now classified as trainees undergoing recruit discipline. A few days later I was part of Company Quebec 77 and our DI was BM1 Cathy and his assistant was RM1 Brown (I met him again at Radio Station Miami 1973). Q77 provided me the typical boot camp experience with lots of PT included. In boot camp there was always something to do and some things were things done over and over again. 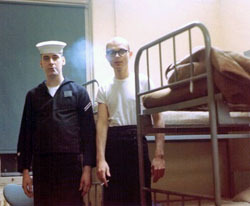 While I was in boot camp I was given the Naval Battery Test. The results of the test were used to indicate a person qualifications for the various CG ratings. My results indicated I was qualified for just about every rate in the Coast Guard except Sonar. I guess I had difficulty determining the tones during the audio portion of the sonar test. Since I wanted to be a cook I was not greatly disappointed by not qualifying for sonar school. When it came time to find out what would follow boot camp I had a short interview with a YN2 regarding my opportunities. When asked what I’d like to do I informed him I’d like to go to commissary school and learn how to cook. The YN2 informed me there were no openings for CS school at this time but from my test results it appeared Id make an exceptional ET or so I was led to believe. Later I found out there was a shortage of Electronics Technicians and there was a push on to make up for that shortage. I persisted about being a cook. The YN then told me I could be put on a wait list for an opening in CS school and in the interim I’d be assigned to a weather cutter in the North Atlantic. It was December and even being from Chicago I knew the North Atlantic wouldn’t be a very pleasant spot to be in January. So, I asked him to tell me more about being an ET. I was told it would be no problem getting into basic ET school at Governor’s Island and after school completion I would then be assigned to a duty station. I opted to go to basic ET school. I went to ET school at Governor’s Island, I did well, graduated, and spent the next few years doing ET stuff and lots of other non-ET stuff. 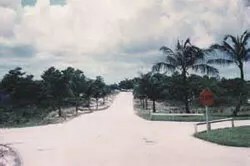 My first duty station was Loran Station Jupiter FL. I spent about two years at Jupiter (1970-1972) before moving on to Loran Station Lampedusa Italy. I spent one year at Lampedusa (1972-1973) before rotating out to Radio Station Miami FL (1973-1974). During my time as an ET I found out quite a lot about the duty stations that were open to ETs. Most were not fun places to be at and a lot of them were either isolated or restricted duty stations. I also found out that billets at some of the better stations seemed to be reserved for married personnel and a single guy like myself could only dream about going to Bermuda or Rhodes Greece (I’m still dreaming about visiting these places). I think it was not being able to determine my future or maybe more specifically not having much of a say in those decisions is why I didn’t make a career out of the Coast Guard. I never did see combat during my tour of duty. About as close as it came to combat was the day a Libyan jet flew over Lampedusa. All we could do was report the incident to let the powers that be know we were being watched. That leaves peacekeeping and humanitarian endeavors which LORAN duty might be construed to cover both. The peacekeeping aspect of LORAN was pretty well understood. LORAN-C provided an indispensable service to other branches of the military. Without LORAN-C it might be difficult for those branches of the military to do their jobs should a first strike response become necessary. Even though you couldnt consider LORAN-C a deterrent it could most certainly be thought of as necessary for helping the other services keep the peace for us. The humanitarian aspect of LORAN was that LORAN A/C could be it’s use as an aid to navigation. Though LORAN-C was mostly used by the government LORAN-A was used by fishermen and such to determine where they were when other methods failed them. As such, LORAN-A provided a very important humanitarian service to those at sea. Was there anything in being a LORANIMAL that was life changing? If nothing else it provided an insight to me that not all the important things in life are always the most visible things. Lets face it, not a lot of people knew how LORAN worked but that it did work and they were happy that it did. They didn’t know what it took to make it work and keep it 99.99% operational either but I never heard user complaints about that. Basically, it was one of those tasks in life that are very important but not highly visible. Things like this are things you have to learn to live with and let others take center stage. I’d have to say being on the commissioning crew for LORSTA Lampedusa was the high point of my enlistment. I found out about being selected for this assignment though not the location shortly after going to my first duty station LORSTA Jupiter Florida. It amazed me that an SNET with no experience would be selecte d for what I thought to be such an important assignment. To make a very long story shorter, building LORSTA Lampedusa and making it operational was one of those once in a lifetime experiences. The crew arrived on the island June 1972 and by that time I was an ET2. 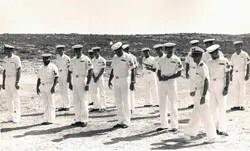 The commissioning crew did so much with so little in such a short period of time it could be described as nothing less than an exceptional achievement. The station was fully operational in less than two months time. The station wasn’t just operational but it was operating amazingly efficiently for a new station with a new crew. A lot of time, effort, and sacrifice went into making things happen and the credit goes to all those who were there on that island during the summer of 1972. My least favorite station was RADSTA Miami which was my final duty station. While on Lampedusa I made ET1 and indicated my choices for where I would like to be stationed at next. To my surprise I was sent to RADSAT Miami after Lampedusa! RADSAT Miami wasn’t on my list of choices for duty stations and I wondered why Miami? I was familiar with the Miami area from being stationed at Jupiter and I knew the Miami area wasn’t for me. I think it was April 1971 when brush fires ravaged south Florida. I was stationed at Jupiter at this time and the Loran station was right in the cross hairs of these brush fires. Being a very dry period helped amplify the impact these fires had. The station managed to get equipment from the National Guard to fight the fires and protect the station. This was the first time I was involved with a round the clock operation and that’s just about what it took to save the barracks, signal power building, and the transmitter building from being engulfed by flames. The crew worked around the clock fighting fires and waiting for the next wave of fires to hit the station. I watched as wild life ran for their lives and the crew used portable hoses and backpack units to protect what could be protected. I didn’t sleep much during those 4-5 days but in the end though the surrounding area was decimated the station was not damaged. I keep this in mind as an exceptional example of a crew working together to overcome exceptional odds. The achievement I’m most proud of was my part in getting LORSTA Lampedusa operational (summer 1972). 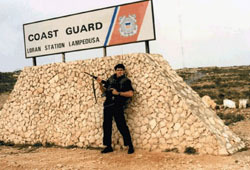 It was a two-year wait at LORSTA Jupiter for me before the orders for Lampedusa arrived. 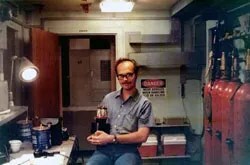 During those two years I made ET3 followed by ET2 and participated in ATLS training at the Naval Ammunition Depot Hawthorne NV (The ATLS equipment was stored at NAD Hawthorne). The next several paragraphs will detail why getting Lampedusa operational was the achievement I was most proud of in the CG. After the NAD training was over I went back to Jupiter to wait for orders to Lampedusa. Some time in the spring of 1972 orders were issued and the location of the station became known. I reported to Governor’s Island and later flew to Italy (Rome then Naples). The crew was billeted in barracks at the Naval Air Station in Naples. From there we departed for Isola de Lampedusa on a Navy C-130 aircraft to build an ATLS. This was June and I found the weather to be HOT and DRY. Temperatures in the low 100s were not unusual in the early morning and 110 degree plus temperatures in the afternoon were common. The crew spent the next month putting the station together and making the equipment operational. 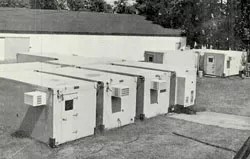 The station consisted of 18 shelters, four 250 KW generators, two pallets, 3 mobilizers, and sets of mobilizer jacks. These shelters were commonly referred to as pinkies because of their color. The lightest pinky weighed about 6 tons and the heaviest tipped the scale at 12 tons. I was part of a group that unloaded the ATLS trailers off of Air Force C-130s that delivered them to the island. As an ET, my main assignment at this time was to go to the landing stri p, pick up a 6-12 ton ATLS pinky, load it on a mobilizer (trailer), transport the pinky to the station (about four miles), and then set the trailer on the ground through the use of four heavy man powered mobilizer jacks. When the trailers arrived by C-130 the final foundations for the trailers were not ready. So, all the pinkies were unloaded, driven to a holding area, lowered via the jacks, and then left there to wait until the concrete slabs for them were ready. This meant each of these trailers had to be raised via the jacks and transported to the slabs and lowered into their final positions yet again. Once the trailers were in place I happily put those 100+ pound jacks to rest in storage knowing full well I would never need to use them again because I would now concentrate on getting the station operational. The Unit Commendation award for LORSTA Lampedusa is the mos t meaningful to me. The task at hand was difficult and I think we were the first and possibly the last Coast Guard crew to have accomplished an ATLS installation. It was an honor to have served with the Lampedusa commissioning crew pictured below. I’m in the center row far left side behind the ENCS in the first row. This picture also helps provide an insight into the scenic beauty Lampedusa had to offer! This is a tough question to answer because I served with many great shipmates. While at Jupiter my watch supervisor was ET2 Bob Nahikian (Nik). Nik new a lot about military life and procedures and passed them as best as possible along to me. Nik was also the best model builder I ever saw. He could make an HO model look as if it was the real thing. However, if I had to pick one person then it would be ET1/ETC John Wright. John was familiar with both the LORAN-C equipment and the ATLS configuration from having been exposed to both on Iwo Jima and Tan My. He was an expert at working on the transmitter and little did I know that would be my calling on Lampedusa. During my year on Lampedusa John became my mentor and taught me all he knew about the transmitters. He also treated everyone with respect and fairness. He was the best CPO I served under during my enlistment. I last saw John in 1982 and then lost contact with him about 1988. 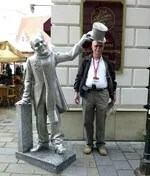 I reconnected with him about 15 years later (2003). I was saddened when I learned of his passing a few years back. During the time spent on Lampedusa records were kept about issues, shortages, and other things that impeded progress. There always seemed to be a shortage of parts and it wasn’t certain why that was. In the event of another ATLS deployment the brass wanted to be sure that most of the shortage issues encount ered on Lampedusa would be avoided. To accomplish this, a small group of us were selected for a temporary duty assignment at NAD Hawthorne NV where the remaining two ATLS were stored. This assignment pre-empted my assignment at RADSTA Miami for about four months. Our task was to inventory the two ATLS in storage and make sure any shortages were filled. One night while at a local watering hole and eatery the five of us got into a conversation with some of the local residents who were curious about what the heck the USCG was doing in the middle of a desert. We told them in no uncertain terms we were the lead surveying team that was investigating possible locations for lifeboat stations along the California-Nevada border. The locals gave us the strangest look and couldn’t believe what we were saying was gospel. We reiterated our statement with straight faces and told them a sea story (desert variety). In the early 1970s billionaire Howard Hughes was buying up lots of Las Vegas and Nevada property. There was also a rumor at that time that California would fall into the Pacific Ocean due to an earthquake. We informed the locals that Hughes had purchased a great deal of property along the California – Nevada border that was soon to become ocean front property after California slid into the Pacific Ocean! It was only natural the CG prepared for this by determining locations for lifeboat stations. Surprisingly they bought it! Even our OIC Mr. Bhend was in on this desert sea story. We eventually came clean and the local cowboys weren’t upset at all and bought us a round of drinks (probably more than one round). I still laugh at this today. This was probably the biggest whopper I ever told. In the Coast Guard I learned that just because I was an ET that didn’t limit my duties to just electronics. I found I had many other duties to perform and that carried over into civilian life where I had multiple careers. Upon leaving the Coast Guard in February 1974 I returned to Chicago and decided to go back to college. The GI Bill helped but I still had to work full time to support myself. My first job was factory work at Danly Machine Corporation in Cicero, ILLINOIS. Danly manufactured large presses for the automobile industry, die sets, and specialty machinery. I started doing electrical assembly work and quickly advanced to the machine repair department to do electrical/electronic repairs on almost any type of metal working machine you could imagine (e.g., lathe, vertical boring mill, horizontal milling machine, screw machine, grinders, and so forth). I also did setup work on the new custom machines that Danly anufactured because the assembly department lacked staff with the necessary expertise. The high point was working on the machinery that fabricated the heat shield for the space shuttle. The shuttle had something like 23000 tiles in the heat shield and 21000 of them had different shapes. I worked at Danly from 1974 to 1983 and left due to an economic downturn. My next career started in 1984 and ran to 2001 was with AT&T Bell Laboratories which morphed into Lucent Technologies. Bell Labs was a wonderful place to work and learn. It was a night and day different from working in a factory like Danly. Bell Labs offered tuition reimbursement and that allowed me to complete my BS and MS degrees in Computer Science. There were so many different things you could do at Bell Labs so work never became mundane. 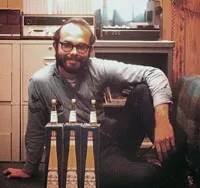 I started in a computer hardware development department, next I wrote software to test computers manufactured in Oklahoma City, I did test lab architecture for telephone switching systems, I tested switching system software, I wrote billing software applications for telephone switches, and I finished up doing customer responses for switching system bids. In 2001 when the Internet bubble broke so did Lucent’s bubble break. I was offered an early retirement at age 51 and took it. 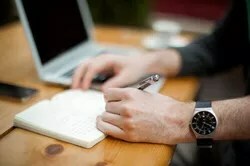 Before leaving Lucent I had already thought about becoming a high school teacher and had taken a few classes necessary for teacher certification. 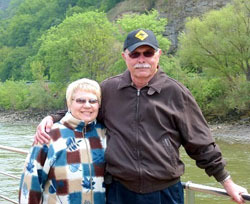 When Lucent made the early retirement offer I was on an extended business trip in Brazil researching a new product. When I heard about the offer I decided to take it and start my teaching career earlier then planned. This was June 2001 and at that time Lucent had approximately 98,000 employees. Two years later there were only 30,000 employees left. Thankfully I made a wise decision when I left for the unknowns of teaching. My first teaching assignment was at Maria HS in Chicago. Maria HS was an all girls Catholic HS. In addition to my teaching Microsoft applications I also taught web programming. In my spare time I was anointed to be the school’s technical coordinator and that title made me responsible for all of the school’s computer hardware, software, and networking needs. During this time I was working on my Master’s in Teaching so I could be officially certified as a teacher in ILLINOIS. Needless to say there was never a dull moment for the three years (2001-2004) I spent at Maria HS. I enjoyed Maria HS a great deal but I did not enjoy the 45 mile one way commute to work. After I received my ILLINOIS state teacher certification I started looking for a position closer to home and I found one at East Aurora HS. My assignment at EA HS was completely different from what I did at Maria HS. My EA HS assignment had to do with Alternative Education. Alternative Education is a fancy name for credit recovery. Credit recovery is a program that serves the needs of students who are behind in credits to graduate. Most of the students in credit recovery classes had not been successful in the traditional classroom so they were provided an opportunity to take courses via computer learning to recover those credits. This is one of the more challenging assignments any teacher can have. While at East Aurora HS I also coached golf and that was a very enjoyable experience for me. I spent nine years at East Aurora HS helping students recover credits necessary for graduation. In 2013 I decided it was time to retire and to start doing all those other things one dreams about while working. For those thinking about teaching as a second career I recommend you do your homework before you take the plunge. Public schools have changed since I graduated high school in 1967 and any potential teacher needs to be aware of that before making a career decision. You might want to try being a substitute teacher before taking the plunge. Together We Served is the only military association I’m a member of. Together We Served allows me to search and see what can be found from the years I served in the Coast Guard. In the Coast Guard I think I acquired an attitude to never give up on anything I did. That didn’t mean I wouldn’t stop working on a project for a while but it did mean I didn’t quit or give up. Some projects I put on the shelf may have taken a while to complete but when they were finished they were great examples of form, fit, and function. I mention this because it did take me quite a while to earn my college degrees that were educational endeavors that I didn’t give up on and were slow in coming to completion. When I joined the Coast Guard in 1969 I knew I’d be with the best and the other branches of the military got the rest. I have no reason to believe things have changed since then. The best advice I can give anyone is to always try and do the best you can. You can never be faulted for having done your best. Together We Served has linked me to a number of shipmates from the past and that helps me to remember that time in my life. I also enjoy reading the biographies of other who served. It also reminds me of my enlistment experience which I wouldn’t trade for anything. Following Tony the Tiger’s lead being in the Coast Guard was GREAT!